This delicious Portuguese style shrimp with bacon recipe (receita de camarões com bacon) makes a mouth watering appetizer. Whisk the lemon juice, garlic, paprika, olive oil, 1/2 teaspoon of salt and pepper to taste in a shallow baking dish. Add the shrimp and toss so it's well coated, marinate in the refrigerator for about 20 minutes. 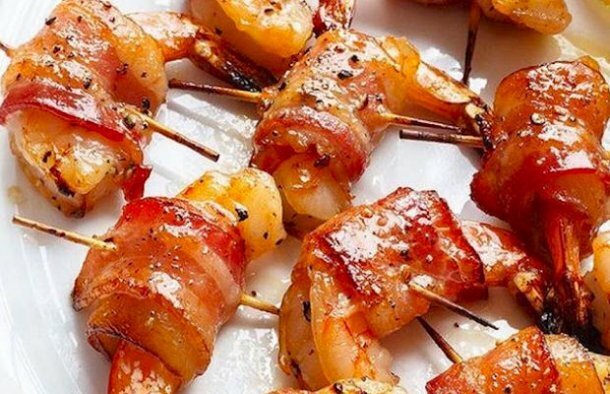 Turn the shrimp in the marinade so it's well coated, than one at a time, remove each shrimp and wrap with a piece of bacon and secure with a toothpick. 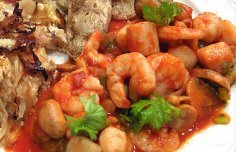 Place the shrimp seam-side down on a baking sheet and spoon any remaining marinade over the shrimp. Bake in a preheated oven at 230ºC or 450ºF until the bacon is crisp and the shrimp are tender, about 10 to 15 minutes. 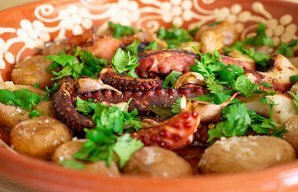 This Portuguese roasted octopus and potatoes (polvo à lagareiro) is one of the most appreciated traditional dishes in Portugal, especially in the summer. 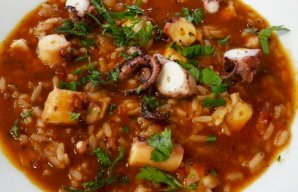 The actual recipe varies from restaurant to restaurant, but the recipe below is based on a traditional favorite, blended to enhance the taste of the octopus and the flavor of the sea.